After fingers and toes: heads! Fingers are busy, toes are warm: all that was needed was to be cared for from top to bottom. So, after a rather frenetic evening of listening to BBC Radio 4 comedy shows online while sitting on the sofa, those of us with warm toes can have warm heads. Mr T admired them “as long as I don’t have to wear one”. Fair enough! 4 Responses to After fingers and toes: heads! Beautiful! 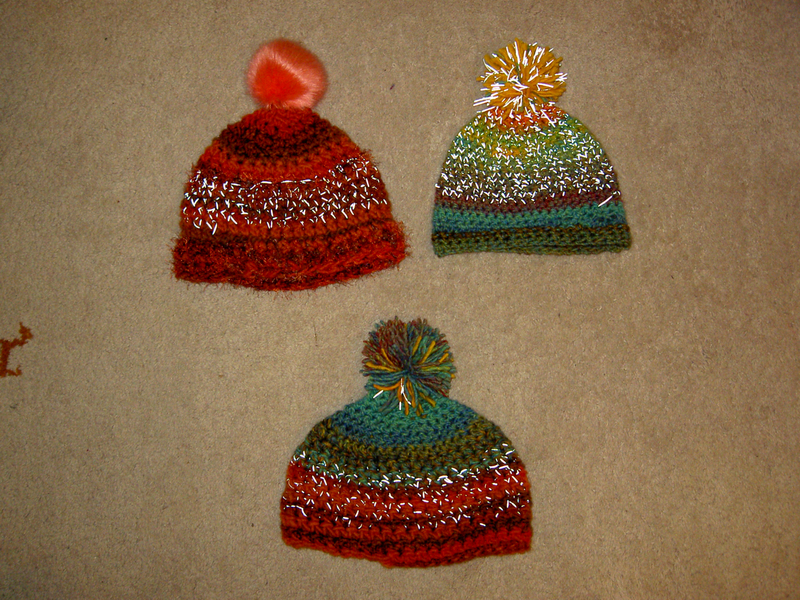 I keep trying to learn to crochet, but it’s too fiddly for me and my SPs, so I leave it to my very talented sister. She once created a pattern for and crocheted a turtle outfit for a newborn baby, shell and all – I kid you not! Love the idea of the reflective thread – you do know you’re a genius, don’t you?! Reflective thread – what a great idea for a hat! The hats look warm and fun. Lol, Mr T didn’t want a valentine’s hat then!